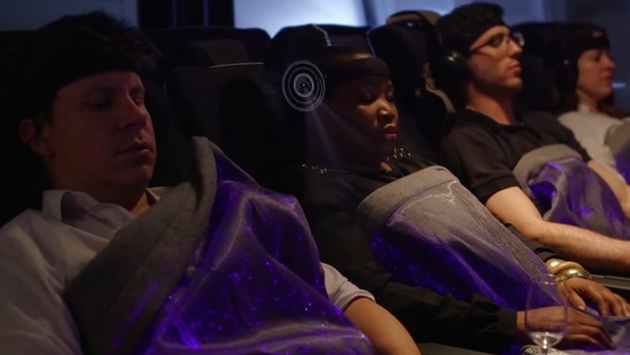 Could LED Mood Blankets Make Your Flight Happier? If you’re old enough to remember ‘mood rings’ from the 1970s then this will amuse you. If you’ve read ‘1984,’ maybe not so much. British Airways is experimenting with the ‘Happiness Blanket,’ a high-tech blanket unlike any of the flimsy blue things airlines have handed out for decades. The Happiness Blanket changes colors based on your mood and emotions. The LED blanket was recently tested in the premium cabin on a BA flight from London to New York. “Using technology like the ‘happiness blanket’ is another way for us to investigate how our customers’ relaxation and sleep is affected by everything on board, from the amount of light in the cabin, when they eat and their position in the seat,” British Airways said in a statement. The technology uses optical fibers stitched into the blanket. The blanket then connects with a headband the passenger wears to transmit the data via Bluetooth. The blanket changes colors and hues from blue (calm and relaxed) to red (stressed or anxious). British Airways says it will continue testing the Happiness Blankets and document the results.